The Snuggie presents a simple solution to a problem you didn’t even know you had. In the fall of 2008, Allstar Products Group, a direct response company based in Westchester, New York, aired the first Snuggie infomercial. It was one of 80 products they advertised that year. "If you told me we could only test 50 products, the Snuggie might not have made the cut," says Scott Boilen, president and CEO. And bring it to the public they did. The Snuggie commercial quickly went from parody fodder to pop culture phenomenon, appearing on Oprah, Ellen, and TODAY. The Snuggie also struck "As Seen on TV" gold. Five years after its first release, the Snuggie has sold over 30 million units and raked in over $500 million, according to Boilen. To put that into perspective -- if the Snuggie were a country it would have the GDP of Samoa. So how did a jokey product allow Allstar to laugh all the way to the bank? The Snuggie spends $34.8 million in advertising each year, according to the Kantar Media unit of WPP. Thomas Haire, editor of Response Magazine (a magazine serving the direct-response community) believes that being able to laugh at the product was what made the Snuggie a success. The Snuggie has revolutionized the As Seen on TV business- it's helped move products from television screens into mass-market retail stores. Wal-Mart (WMT), Bed Bath & Beyond (BBBY), and Walgreen (WAG) are just a few of the national chains that stock large As Seen on TV sections. In fact, 95% of Allstar’s revenue now comes from physical stores- they actually lose money on direct response ads. "The velocity that Snuggie moved at retail got us from the back of the store to the front of the store. We’re needle movers for the retailers," says Boilen. 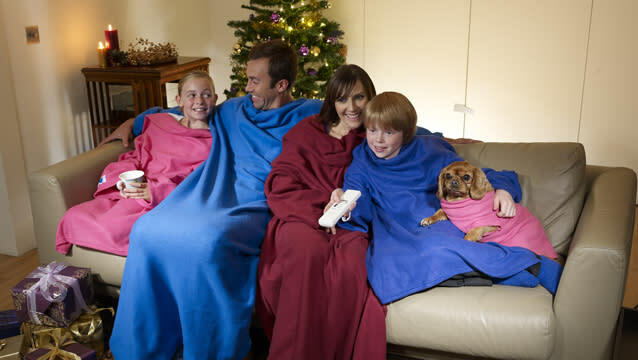 The Snuggie continues to release four new products a year and those products continue to sell out. "Our biggest problem was how could we make enough of that product fast enough. We go to China, we contract out as many factories as we can and we were sometimes making hundreds of thousands a day," says Boilen. From dog beds to tandem Snuggies the company has tried it all and will be releasing a special updated version for their 5th Anniversary (stay tuned to The Daily Ticker for the exclusive announcement!). Even after half a decade, Boilen still finds himself baffled by the blankets success. "If I knew how the Snuggie became so successful we’d have 15 more products like that. It just struck a chord at the right time." Watch the video above to get an exclusive look at the Snuggie headquarters and to see The Daily Ticker's Lauren Lyster try one on. Does It Matter That Americans Are 'Subsidizing' Astronomical CEO Pay? Whalen: "We Went Way Too Far With Dodd-Frank"